NOW AVAILABLE! 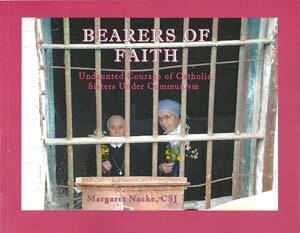 Sister Margaret Nacke has just published her latest work, a collection of personal testimonies titled “BEARERS OF FAITH: Undaunted Courage of Catholic Sisters Under Communism.” In their own words, Catholic sisters tell their story of life in Central and Eastern Europe during the 40 years of communist rule. Since 1993, Sister Margaret and Sister Mary Savoie have collaborated with Eastern European sisters as they have moved — and continue to move — from a clandestine life of oppression to a life of freedom in a complex world. The book is available through lulu.com for $19.95 plus shipping. For more information or to order your copy, CLICK HERE. Go directly to the Interrupted Lives web site! CLICK HERE for the latest “Interrupted Lives” News.